To grasp the magnitude of the disaster in the Gulf, consider this: The 1989 Exxon Valdez spilled 10.8 million gallons of oil into Alaska’s Prince William Sound. The Deepwater Horizon rig, which exploded on 20 April, has already released an estimated 9 million gallons of oil into the Gulf. This means that the well releases between 10,000 and 15,000 barrel of oil into the water (there are 42 gallons in a barrel of oil). Now, BP says it will take about three months to cap the underwater gusher — meaning that we should expect the equivalent of 900,000 barrels, or 37,800,000 gallons, to be released into the water yet. 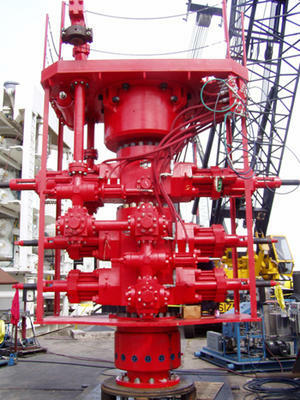 Allen has expanded already extensive efforts to disperse, skim, burn, and block the oil that is surfacing from the well blowout that destroyed the Deepwater Horizon drill rig last month. He told a media briefing that his top job is stopping the flow of new oil into the sea — a complex and risky process at the one-mile depths where Deepwater Horizon drilled. Peter Fairley writes in Technology Review that the oil leak also reveals an over-reliance on one piece of equipment that academic and industry experts have warned of for close to a decade: The blowout preventers, or BOPs, which are the industry’s primary line of defense against deepwater oil spills. Industry experts told Fairley that BOPs will be front and center in a review of offshore drilling technology ordered by Obama last week, to be completed this month, prior to authorizing any further drilling. “A thorough review and technology change is likely coming now,” says Paul Bommer, a senior lecturer in petroleum engineering at the University of Texas at Austin.